Songs from the Second Floor | TURN OFF YOUR CELL PHONE! Roy Andersson’s Songs from the Second Floor is the most insightful piece of art yet made about the Great Recession. The amazing thing is it came 9 years too soon, released in 2000. I have extolled the virtues of Andersson’s follow up You, The Living without having experienced his masterpiece: a collection of 40 odd static-camera, impeccably choreographed, diorama-like set piece vignettes populated by zombified, frowning characters. This is a world where the sun never shines and the streets and buildings carry no character. Trash piles in barren fields outside monolith apartment blocks. 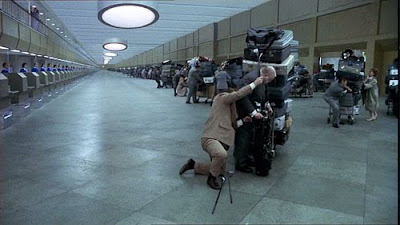 The indoor scenes carry the grime recalling the deepest recesses of the Ministry of Information in Terry Gilliam’s Brazil. A traffic jam, caused by nothing, people pleading to get out of it but not knowing where they are going. Men and women in business wear self-flagelate in unison like monks during the plague. A child’s metaphorical designs on a birthday cake leads to a ritual plank walking. Couples struggle for hours to drag their belongings, packed in suitcases, piled on carts to airport ticket counters like a macabre Sisyphian contest. Economists sit around a table and fail to explain a paradox and rush for the door when a house is seen to move. Beautiful/grotesque and absurd and stingingly poignant. Treat yourself and see this film. This entry was posted on April 20, 2010 at 7:01 pm and is filed under Uncategorized. You can subscribe via RSS 2.0 feed to this post's comments. You can comment below, or link to this permanent URL from your own site.